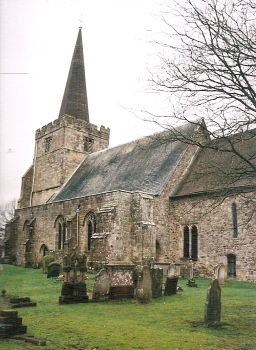 A large church, the structure of which is mainly C13, though a late C12 north chapel reveals an earlier origin. It was remodelled in the C15 with a tower and a porch. The fittings include wall paintings (possibly C15), a C16 font cover, a magnificent C17 pulpit and Burne-Jones glass. 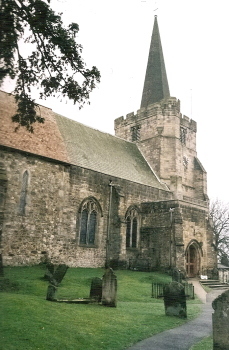 The village on a hill is the centre of a large Wealden parish, from which several others have been formed, including Crowborough. The abbey of St Denis held lands here after the Conquest (Jessup p217), which explains the dedication, though according to legend links go back to the cure in 792 of a Sussex nobleman, Bertwald, after a pilgrimage there. The north chapel is late C12. An altered arch of this date with plain square abaci opens into the aisle and there was a semi-circular opening in the gable, which is no longer visible (2 p243). Chapels were usually added to existing chancels, but there is no sign of what date this might have been. Also late C12 is the square east respond of the otherwise late C13 two-bay arcade to the chancel which has a plain abacus. On the exterior of the east wall of the south aisle is a small, blocked arch, of which the north jamb has been cut away and next to it in the chancel wall is the jamb and part of the head of a larger, single arch. A fragment of a moulded abacus is also late C12 and taken together, these suggest a smaller south chapel. Alternatively, the arches led to a tower (1 p52), but only excavation could provide the answer, for whichever it was, it was removed in the C15 (see below). The presence of a late C12 arch from the north chapel into the aisle shows that a north aisle was already intended if not yet built then. The present north arcade looks early C13, with round piers and slight chamfers and it is most likely that it followed on from the building of the chapel. The three-bay south arcade is similar but probably a little later in date, as the corbel-responds indicate. Though restored, these resemble others in the area. The aisles were then narrower with sloping roofs, but despite C15 alterations both west walls retain lancets. The late C13 rebuilding of the chancel included long side lancets, with a string-course linking the sills of those in the sanctuary. The north chapel was also altered, with similar lancets and a segment-headed, hollow-chamfered doorway. The chancel arch has three orders, of which the innermost is on semi-octagonal shafts attached to the responds. Its label is incomplete and may have been altered when the rood-loft was installed at a later but pre-Reformation date, with the entrance to the stair to the south. The plain roof of the chancel could be later C13 as well. 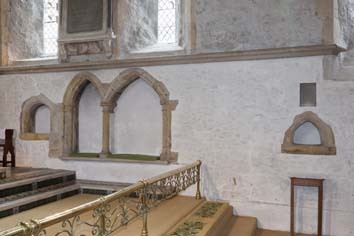 The arcade to the north chapel with an octagonal pier is most like the south nave one, suggesting that reconstruction of the chancel may have started here. The late C14 east window of the north chapel has unusually thick mullions and the tracery combines panelling with a quatrefoil. In the C15, the aisles were widened and heightened with almost flat roofs behind parapets and plain beams inside. The pointed windows have two lights with simple panelled tracery. The Sharpe Collection drawing (1803) shows more varied tracery than today, including a south east window with a quatrefoil. That suggests that the remodelling of at least the south aisle may have been started soon after the east window of the north chapel. A north porch of two storeys with a simple rib-vault resembles those of other churches in the area, like Mayfield and Ticehurst. The plain top may have been altered and the upper chamber lacks windows. The arch and north doorway are moulded with distinctive triangular stops at the base. The upper chamber was approached from the aisle and the lower entrance is some way off the floor, so there was a wooden stair. This work is in sandstone ashlar, including the tower. This has three stages, battlements, a polygonal stair-turret and diagonal buttresses. The detail, a four-centred west window and a tall tower arch with semi-octagonal responds, is late C15. Until 1987 (see below), the tall spire was of the same date (CBg 15 p39). The boarded wagon roof of the north chapel is also C15, with bosses, which include grotesque heads and the badge of the Nevilles, to whom it belonged and who may have supported the other work. The nave roof is similar, but unboarded, with moulded main timbers. The lack of a clerestory makes the interior dark. The biggest element of display apart from the tower is the five-light east window of panelled tracery. Of the same date is a two-light square-headed lowside in the blocked south arch of the chancel. It cuts into the outline, so whatever stood here was removed at this time or earlier. The Sharpe drawing shows the south side much as today except for the aisle windows. This includes the massive diagonal buttress at the east end, which is post-Reformation. The date of 1730 on the porch may give the date of alterations to the upper part. 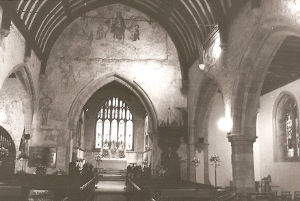 In 1873-74 R Nevill (who was not related to the Nevilles) restored the chancel (B 31 p212). He designed the main fittings (see below), restored the east window and procured new glass. The work was well done and is interesting in its own right, without obscuring the phases of development. The rest followed in stages between 1889 and 1893 under J Medland and C E Powell (B 66 p21), who were associates of Nevill. E Christian is said to have overseen the later stages and to have approved what had been done (ibid). All the work between 1873 and 1893 is said to have cost £3470 (KD 1899). Most recently the spire fell in the hurricane of 1987, damaging the west end of the north aisle. The repairs by R Wood included a new spire of identical profile with a stainless steel frame. He has described how this was lifted into place by helicopter (CBg 15 ibid). Altar rails: Brass, by R Nevill, 1873 (A 9 p161). Corbels: (Above the tower arch) Probably C15, but their purpose here is obscure. Font: Plain and octagonal with a moulded top and probably C15 or early C16. Font cover: Dated 1533. Like an octagonal cupboard with a conical top, panelled sides (some of which open) and decorated with arabesques in the Renaissance style and the arms of the Nevilles. It must be the ‘tabernacle’ that cost £3 7s 2d in the churchwardens’ accounts for 1532-35 (SAC 41 p38) and is like those at Sedlescombe and Ticehurst. A second date, 1816, records repairs, which included probably most of the visibly renewed frame. 1. (North chapel) C15 fragments. 2. (East window) Morris and Co, 1874. The figures are by Sir E Burne-Jones and the foliage background by W Morris. It shows the Te Deum and the contrast between the predominant greens and blues of the background and the colourful figures makes this one of the finest windows by the company of this period. 3. 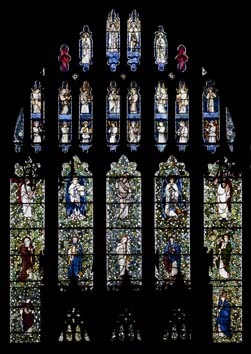 (South chancel, fourth window) J Powell and Sons, designed by G Parlby, 1903 (Hadley list). 4. (South aisle, first and second windows) J Powell and Sons, 1895 (designer not recorded) and 1900, designed by A Currey (ibid). 5. (South aisle, third window) A L Moore, 1900 (signed). 6. (North aisle, third window) J Powell and Sons, designed by G Parlby, 1912 (CBg 13 p30) and restored after storm damage in 1987. 7. (North aisle, second and third windows) J Powell and Sons, 1916 designed by J H Hogan (Hadley list) and 1934 designed by J H Hogan with H S Hodges (ibid). Lectern: Brass eagle, designed by Nevill, 1873 (A 9 ibid). 1. (North aisle floor) Iron tomb-slab with an embossed cross but no name and likely to commemorate a priest. It is pre-Reformation and thus early, though recent research (SAC 125 (1987) p103) suggests that such slabs are not earlier than the C16. 2. (Chancel) Nicholas Fowle (d1656) Tablet signed TS, identified as T Stanton (Roscoe p1180). 3. (North chancel) Humphrey Fowle (d1756). Tablet with ogees in the pediment. Attributed to R Taylor senior (BE(E) p597). 1. (East wall of nave) Found in 1893 (3 p213). 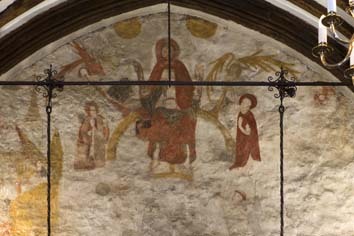 Above the chancel arch, surrounded by angels and saints, Christ sits in judgement, blood flowing from His wounds; the outer parts of the composition have largely disappeared. 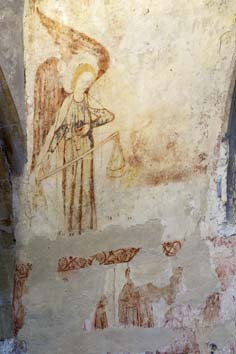 Lower down, St Michael is shown weighs souls. More colour than usual survives. 2. (North aisle above eastern arch) The Incredulity of St Thomas, an unusual subject, but less well preserved. Christ is shown holding the banner often associated with Him after the Resurrection. 3. (Jamb of east window of north chapel) Angel, possibly from an Annunciation. Some of the walls are painted to imitate masonry. 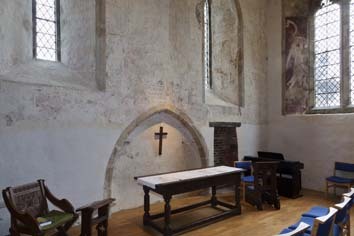 These paintings have been variously dated, but both the first (see 3) and the most recent study incline to c1400, with possible later C15 repainting in places(www.paintedchurch.org retrieved on 29/4/2013). In particular, the presence of one by the east window of the north chapel, which is at the earliest later C14, supports this dating, since all the paintings belong together. It is possible (ibid) that the St Thomas is slightly earlier than at least the Doom. Pews: (Nave) Early C19 box-pews, though cut down. At the west end they rise slightly, as in a theatre, to improve visibility. 1. (South aisle) Plain pointed and probably C13. 2. 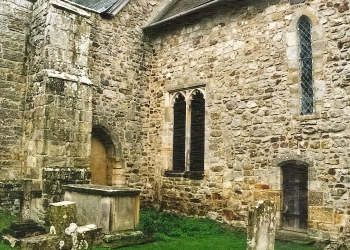 (North chapel – east wall) Plain square-headed C13. 3. (South chancel) The four-centred head suggests this is a C15 insertion. Pulpit: Lavishly carved early C17, made by F Gunby of Leeds and acquired in about 1896 by the then rector’s wife from Bishopsthorpe, the palace of the Archbishops of York (WSRO Ep II/27/215) after it had been discarded as it was in the wrong style. Its sounding board has fretwork and obelisks and a back panel with eagles in silhouette. Recess: (West of sedilia in chancel) Purpose and date uncertain. Reredos: Spiky alabaster and marble, by Nevill, 1873 (A 9 ibid). Made by Field, Poole and Sons of Westminster (B 31 ibid). Royal Arms: (North aisle) Painted of George I and dated 1723. Screens: (North chancel arcades) C15 parcloses with heads of varying tracery. The tops are not old. Sedilia: (South chancel) C13 double. Simple heads with shafts and capitals, of which that to the west is a double one. My thanks to Nick Wiseman for the colour photographs of the interior and fittings.